The Secretary-General was envisioned by U.S. President Franklin D. Roosevelt as a "world moderator", but the vague definition provided by the United Nations Charter left much room for interpretation. The Secretary-General is the "chief administrative officer" of the UN (Article 97) "in all meetings of the General Assembly, of the Security Council, of the Economic and Social Council and the Trusteeship Council, and shall perform other functions as are entrusted to him by these organs" (Article 98). They are also responsible for making an annual report to the General Assembly. They may notify the Security Council on matters which "in their opinion may threaten the maintenance of international peace and security". Other than these few guidelines, little else is dictated by the Charter. Interpretation of the Charter has varied between Secretaries-General, with some being much more active than others. The Secretary-General, along with the Secretariat, is given the prerogative to exhibit no allegiance to any state but to only the United Nations organization; decisions must be made without regard to the state of origin. The Secretary-General is highly dependent upon the support of the member states of the UN. Although the Secretary-General may place any item on the provisional agenda of the Security Council, much of their mediation work takes place behind the scenes. In the early 1960s, Soviet First Secretary Nikita Khrushchev led an effort to abolish the Secretary-General position. The numerical superiority of the Western powers combined with the one state, one vote system meant that the Secretary-General would come from one of them, and would potentially be sympathetic towards the West. Khrushchev proposed to replace the Secretary-General with a three-person directorate (a "troika"): one member from the West, one from the Eastern Bloc, and one from the Non-Aligned powers. This idea failed because the neutral powers failed to back the Soviet proposal. The Secretary-General is appointed by the General Assembly upon the recommendation of the Security Council. As the recommendation must come from the Security Council, any of the five permanent members of the Council can veto a nomination. Most Secretaries-General are compromise candidates from middle powers and have little prior fame. Unofficial qualifications for the job have been set by precedent in previous selections. The appointee may not be a citizen of any of the Security Council's five permanent members. The General Assembly resolution 51/241 in 1997 stated that in the appointment of "the best candidate", due regard should be given to regional (continental) rotation of the appointee's national origin and to gender equality,:5 although no woman has yet served as Secretary-General. The length of the term is discretionary, but all Secretaries-General since 1971 have been appointed to five-year terms. Every Secretary-General since 1961 has been re-selected for a second term, with the exception of Boutros Boutros-Ghali, who was vetoed by the United States in the 1996 selection. There is a term limit of two full terms, established when China cast a record 16 vetoes against Kurt Waldheim's third term in the 1981 selection. No Secretary-General since 1981 has attempted to secure a third term. The selection process is opaque and is often compared to a papal conclave. Since 1981, the Security Council has voted in secret in a series of straw polls. The Security Council then submits the winning candidate to the General Assembly for ratification. No candidate has ever been rejected by the General Assembly. In 2016, the General Assembly and the Security Council sought nominations and conducted public debates for the first time. However, the Security Council voted in private and followed the same process as previous selections, leading the President of the General Assembly to complain that it "does not live up to the expectations of the membership and the new standard of openness and transparency". The official residence of the Secretary-General is a townhouse at 3 Sutton Place, Manhattan, in New York City, United States. The townhouse was built for Anne Morgan in 1921, and donated to the United Nations in 1972. After World War II, he served as Executive Secretary of the Preparatory Commission of the United Nations in August 1945, being appointed Acting United Nations Secretary-General from October 1945 to February 1946 until the appointment of the first Secretary-General, Trygve Lie. Lie, a foreign minister and former labour leader, was recommended by the Soviet Union to fill the post. After the UN involvement in the Korean War, the Soviet Union vetoed Lie's reappointment in 1951. The United States circumvented the Soviet Union's veto and recommended reappointment directly to the General Assembly. Lie was reappointed by a vote of 46 to 5, with eight abstentions. The Soviet Union remained hostile to Lie, and he resigned in 1952. After a series of candidates were vetoed, Hammarskjöld emerged as an option that was acceptable to the Security Council. He was re-elected unanimously to a second term in 1957. The Soviet Union was angered by Hammarskjöld's leadership of the UN during the Congo Crisis, and suggested that the position of Secretary-General be replaced by a troika, or three-man executive. Facing great opposition from the Western nations, the Soviet Union gave up on its suggestion. Hammarskjöld died in a plane crash in Northern Rhodesia (now Zambia) in 1961. U.S. President John F. Kennedy called Hammarskjöld "the greatest statesman of our century". In the process of replacing Hammarskjöld, the developing world insisted on a non-European and non-American Secretary-General. U Thant was nominated. However, due to opposition from the French (Thant had chaired a committee on Algerian independence) and the Arabs (Burma supported Israel), Thant was only appointed for the remainder of Hammarskjöld's term. He was the first Asian Secretary-General. The following year, on 30 November, Thant was unanimously re-elected to a full term ending on 3 November 1966. He was re-elected on 2 December 1966, finally for a full 5-year term, ending on 31 December 1971. Thant did not seek a third election. Waldheim launched a discreet but effective campaign to become the Secretary-General. Despite initial vetoes from China and the United Kingdom, in the third round, Waldheim was selected to become the new Secretary-General. In 1976, China initially blocked Waldheim's re-election, but it relented on the second ballot. In 1981, Waldheim's re-election for a third term was blocked by China, which vetoed his selection through 15 rounds; although the official reasons by the Chinese government for the veto of Waldheim remain unclear, some estimates from the time believe it to be in part due to China's belief that a Third World country should give a nomination, particularly from the Americas; however, there also remained the question of his possible involvement in Nazi war crimes. From 1986 to 1992, Waldheim served as President of Austria, making him the first former Secretary-General to rise to the position of head of state. In 1985, it was revealed that a post–World War II UN War Crimes Commission had labeled Waldheim as a suspected war criminal – based on his involvement with the army of Nazi Germany. The files had been stored in the UN archive. Pérez de Cuéllar was selected after a five-week deadlock between the re-election of Waldheim and China's candidate, Salim Ahmed Salim of Tanzania. Pérez de Cuéllar, a Peruvian diplomat who a decade earlier had served as President of the UN Security Council during his time as Peruvian Ambassador to the UN, was a compromise candidate, and became the first and thus far only Secretary-General from the Americas. He was re-elected unanimously in 1986. The 102-member Non-Aligned Movement insisted that the next Secretary-General come from Africa. With a majority in the General Assembly and the support of China, the Non-Aligned Movement had the votes necessary to block any unfavourable candidate. The Security Council conducted five anonymous straw polls—a first for the council—and Boutros-Ghali emerged with 11 votes on the fifth round. In 1996, the United States vetoed the re-appointment of Boutros-Ghali, claiming he had failed in implementing necessary reforms to the UN. On 13 December 1996, the Security Council recommended Annan. He was confirmed four days later by the vote of the General Assembly. 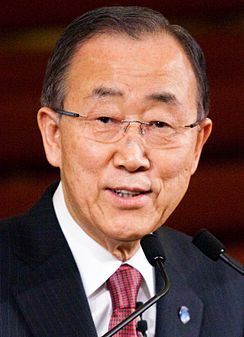 He started his second term as Secretary-General on 1 January 2002. He is the first UN Secretary General to win the Nobel Prize for Peace. Ban became the first East Asian to be selected as the Secretary-General and the second Asian overall after U Thant. He was unanimously elected to a second term by the General Assembly on 21 June 2011. His second term began on 1 January 2012. Prior to his selection, he was the Foreign Minister of South Korea from January 2004 to November 2006. Guterres is the first former head of government to become Secretary-General, and the first Secretary-General born after the establishment of the United Nations. He was Prime Minister of Portugal from 1995 to 2002. He has also been President of Socialist International (1999–2005) and United Nations High Commissioner for Refugees (2005–2015). This is a graphical lifespan timeline of the Secretaries-General of the United Nations. They are listed in order of office. As of April 2019, the only former Secretaries-General that are alive are Javier Pérez de Cuéllar and Ban Ki-moon. The most recent death of a former Secretary-General was that of Kofi Annan (1997–2006) on 18 August 2018. ^ "Who is and has been Secretary-General of the United Nations? - Ask DAG!". ask.un.org. Retrieved 3 February 2019. ^ "Nikita Khrushchev: Address to the UN General Assembly, Sept. 23 1960". Fordham University. ^ "1960: Khrushchev anger erupts at UN". BBC On This Day. BBC. 29 September 1960. ^ "Kofi Annan: Job at a Glance". PBS. Educational Broadcasting Corporation. 2002. Archived from the original on 20 April 2016. ^ Appointing the UN Secretary-General (PDF). Research Report. 2015, no. 2. New York: Security Council Report, Inc. 16 October 2015. pp. 4–5. ^ Sengupta, Somini (21 July 2016). "Secrecy Reigns as U.N. Seeks a New Secretary General". The New York Times. ^ "A Well-Read Secretary General". The New York Times. 13 December 1981. With a figurative puff of white smoke, the United Nations Security Council finally selected a new Secretary General – a seasoned and soft-spoken diplomat from Peru, Javier Perez de Cuellar. ^ "Letter from Mogens Lykketoft to All Permanent Representatives and Permanent Observers to the United Nations, 21 July 2016" (PDF). 21 July 2016. ^ Teltsch, Kathleen. "Town House Offered to UN", The New York Times, 15 July 1972. Retrieved 27 December 2007. ^ Stout, David (26 October 1996). "Lord Gladwyn Is Dead at 96; Briton Helped Found the UN". The New York Times. Retrieved 31 October 2008. ^ The United Nations: Trygve Haldvan Lie (Norway). Retrieved 13 December 2006. ^ a b c d e f "An Historical Overview on the Selection of United Nations Secretaries-General" (PDF). UNA-USA. Archived from the original (PDF) on 25 October 2007. Retrieved 30 September 2007. ^ The United Nations: Dag Hammarskjöld (Sweden). Retrieved 13 December 2006. ^ Linnér, S. (2007). Dag Hammarskjöld and the Congo crisis, 1960–61 Archived 5 April 2012 at the Wayback Machine. Page 28. Uppsala University. (22 July 2008). ^ United Nations: U Thant (Myanmar). Retrieved 13 December 2006. ^ The United Nations: Kurt Waldheim (Austria). Retrieved 13 December 2006. ^ Nossiter, Bernard D.; Times, Special To the New York (29 October 1981). "China Continues to Bar Waldheim Renomination". The New York Times. ISSN 0362-4331. Retrieved 14 February 2019. ^ Editors, History com. "Waldheim elected U.N. secretary-general". HISTORY. Retrieved 14 February 2019. ^ The United Nations: Javier Pérez de Cuéllar (Peru). Retrieved 13 December 2006. ^ The United Nations: Boutros Boutros-Ghali (Egypt). Retrieved 13 December 2006. ^ The United Nations: The Biography of Kofi A. Annan. Retrieved 13 December 2006. ^ "Kofi Annan of Ghana recommended by Security Council for appointment as Secretary-General of United Nations" (Press release). United Nations. 13 December 1996. Retrieved 12 December 2006. ^ Traub, James (2006). The Best Intentions. New York: Farrar, Straus and Giroux. pp. 66–67. ISBN 978-0-374-18220-5. ^ "General Assembly appoints Kofi Annan of Ghana as seventh Secretary-General" (Press release). United Nations. 17 December 1996. Retrieved 12 December 2006. ^ "Ban Ki-moon is sworn in as next Secretary-General of the United Nations". United Nations. ^ "Ban Ki-moon gets second term as UN chief". The Globe and Mail. 22 June 2011. Archived from the original on 24 June 2011. ^ "Former UN secretary-general Kofi Annan dies". The Telegraph. Retrieved 18 August 2018. How is the Secretary-General appointed? This page is based on the Wikipedia article Secretary-General of the United Nations; it is used under the Creative Commons Attribution-ShareAlike 3.0 Unported License (CC-BY-SA). You may redistribute it, verbatim or modified, providing that you comply with the terms of the CC-BY-SA.